It’s summer in Florida and not my favorite time of year. We go out on the boat about once a week, and it’s been high tide at the times we recently traveled the waterways. High tide means fewer beaches and exposed sand out in the river. The normal places to find big living conchs, like the horse conch, are under water at high tide and more difficult to see. Tiger lucinia (or dosinia? 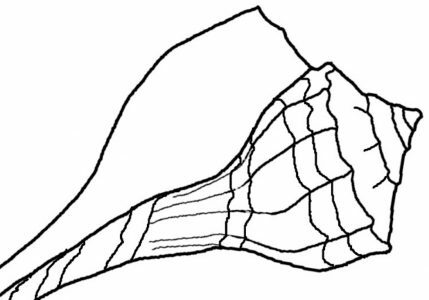 ), Spectral bittersweet clam (or venus clam? ), white and black jingle shells. The shells in my photo above confuse me. Many shells look A LOT ALIKE… So sometimes I am guessing as to the exact name. The flat white shell with concentric rings is probably a Dosinia, but the Tiger lucinia is almost identical looking – except that my reference book says that the underside can be pink and yellow. The shell I found is white underneath – it’s the one with the crack in the shell. The jingle shells are pretty easy to recognize. Their thin shells remind me of the mineral mica. At high tide, island beaches become scarce and small, but there are still plenty of hermit crabs scurrying around in their beautiful crown shells, pear shells and shark’s eyes in the shallow water offshore. My little video here is of a big Tulip shell inhabited by a hermit crab. I don’t know which type of tulip it is because the shell is black and covered with barnacles. This is only one of the many hermit crabs I found near the shore. This is a screenshot of the temperature where I live at 7:14 in the evening… as you can see it FEELS LIKE 100! So at noon, you can just imagine the oppressive heat… it’s why we don’t go out on the boat all that much these days. The heat and humidity here in Florida is stupid. And there is little relief when evening arrives. 7:14 at night and it feels like 100 degrees! Being right on the water means a sea breeze can cool things off, and my favorite time to visit the beach is later in the day. I don’t live on the beach, but I live close enough to visit any time. However, I do look forward to Fall, when it will be less crowded and less humid on and near the water. So many seashells look very similar. I never knew there was such a variety, until I began paying attention. Yes, it’s horribly hot here. Never visit Florida in summer! !